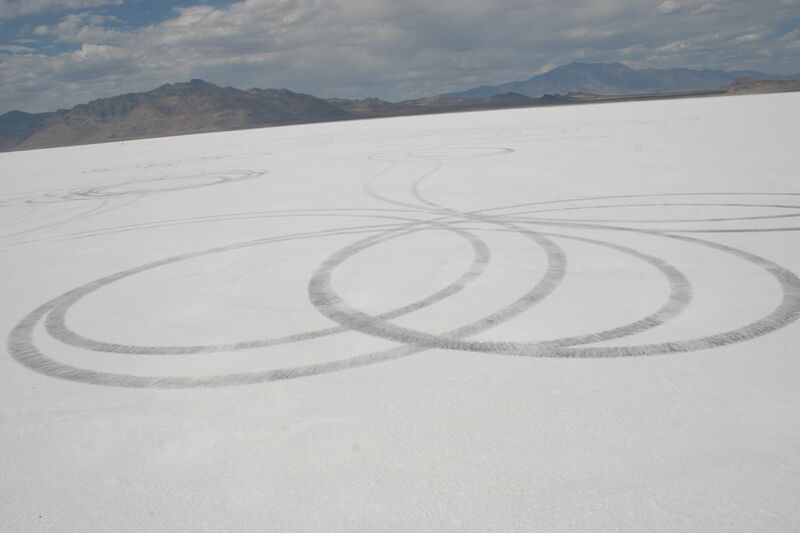 Skidmarks observed at Bonneville in 2006. Photo by the author. “Yeah, racing has an impact on how the salt grows,” said Brenda Bowen, a University of Utah geologist who led the study that looked at the decades-long pattern of thinning and shrinking of the salt flats and that considered the roles of humans in that pattern. The practice of smoothing the surface of the salt flats was the primary factor when taking into account racing’s impact, Bowen said. As pointed out in the study, the areas dragged for racing “correlated with the largest reductions in salt crust thickness from 1974 to 1988 and again from 2003 to 2016.” Bowen said that’s likely because dragging the salt “fundamentally changes how water flows through the crust,” reducing the salt’s permeability and thus its ability to absorb the salt-laden floodwaters crucial to salt crust growth. Nor do the tens of thousands of racers and spectators who attend racing events at Bonneville (Speedweek dates back to 1949, but organized automobile racing has taken place there as far back as 1914) or the handful of non-racers who get stuck while driving on the flooded flats play an insignificant role in Bonneville’s changes. Dragging, however, is far from the only or even the largest anthropogenic cause of the thinning and shrinking salt. Bowen’s study, published this month by the Utah Geological Association, pointed out a number of ways in which humans have fundamentally changed the salt flats. Construction of Interstate 80 — which now bisects the salt flats — in the 1960s, permanently interrupted the natural movement of salt-laden brine across the surface of the flats, disrupting the natural cycle of flooding and evaporation. “The observed difference in the timing of volume decreases at BSF, with the greatest change between 1960 and 1974, may suggest that the major landscape modifications made in association with the building of I-80 played a pivotal role in altering the BSF system,” the report notes. The most quantified human cause of change as listed in the report, however, falls to potash mining at the Bonneville Salt Flats. Intrepid Potash, which leases the flats from the Bureau of Land Management, regularly mines the flats by draining brine from the northern part via a series of ditches and canals, then allowing the water to evaporate in ponds on the southern part. While some of the salt is sold off, most of it is considered a waste product from the production of potash, which is used largely for fertilizer. According to the report, from 1960 through 2016 “it is possible that more than 17-million tonnes of NaCl were removed,” about 30 percent of the estimated 56-million tonnes of salt that the Bonneville Salt Flats lost during that period, as determined by a companion report. That doesn’t include the countless tons of salt removed from the flats since potash mining began there in 1917. That number also doesn’t account for the 10-million tons of salt that Intrepid and its predecessor have pumped back onto the salt flats since 1997 as part of a salt laydown project, first conducted as an experiment in conjunction with the BLM (from 1997 through 2002), then voluntarily (from 2005 through 2012), and finally under BLM orders as part of the company’s lease (from 2012 to present). According to the companion report, the salt laydown project appears to have slowed the overall depletion of the salt to roughly half a percent of its volume (or about 385,000 cubic meters) per year. That correlates to an estimated 27-percent decrease in volume since 1960, “which is consistent with the dramatic change that the racing community has reported,” she said. However, as she did last year when discussion of a supercharged salt laydown project began, Bowen cautioned in the report that the salt laydown project — which relies on the pumping of salt dissolved in industrial wastewater back onto the flats — can only do so much to reverse the depletion of the salt. “The system is limited by the amount of available water, and fluxes of both solutes and water from the BSF system will drive changes in the solubility and saturation of evaporative phases,” she wrote in the report. To determine the overall extent of salt depletion at Bonneville, Bowen and her team drilled about 70 different core samples around the northern part of the salt flats, measured the thickness of the crust and the composition of the samples, determined total crust size via satellite photos, and compared their findings against reasonably similar data collected in 1960 (by the Utah Department of Highways), 1974 (by the Utah Geological Survey), 1988, and 2003 (the latter to by the BLM). Bowen, who took racers’ perspectives into account and visited Speedweek during the preparation of the reports, said it’s challenging to attribute specific changes to the racers’ activity, partially because, as a geologist, she also has to take into account natural causes that might contribute to the changing landscape at Bonneville. Along with three PhD students and a battalion of undergrads, Bowen has studied the salt flats for a couple years now, visiting the flats at least once a month to take measurements. Intriguingly, she started studying the salt flats due to her interest in astrobiology and extremophiles. “I was doing some research into how microorganisms live in extreme environments and push the limits of habitability and how they interact with geology and got a small NASA grant to look at microbes in the salt,” she said. Through that small project, she met many of the stakeholders in the Bonneville Salt Flats — representatives from BLM, Intrepid, and the racing community among them — which led to her larger research on the flats. While the BLM mandated the most recent study in 2012 as part of Intrepid’s lease agreement, a four-year $1.5-million National Science Foundation grant, along with some funding from the BLM, NASA, and Intrepid — made the report possible. As for whether Bowen believes the Bonneville Salt Flats should be restored to its prior thickness and extent, as the Bonneville racers, SEMA, the FIA, and the state of Utah have argued, she declined to answer directly. Bowen plans to continue to study the salt flats for at least another couple of years under the National Science Foundation grant.